This is a preschool Bible lesson over Daniel Chapter One that is perfect for using with a group of small children in a church setting. Today I found myself with the task of adapting a Bible lesson for preschoolers. The lesson was over Daniel Chapter One. You know the story — Daniel and his friends are taken into captivity and are immediately placed in a situation where it would be easy for them to compromise their faith. Who would have blamed them, really . . . after all, it was only food. But these four young men refused to compromise their faith. They stood firm in their convictions and did not eat the king’s food, and, in the end, God blessed them and they found favor with the king. As I worked on adapting this lesson, I decided that I would share the finished product here on Ministry Mom. I’m sure there are others out there who could use some ideas on how to teach this lesson to preschoolers. 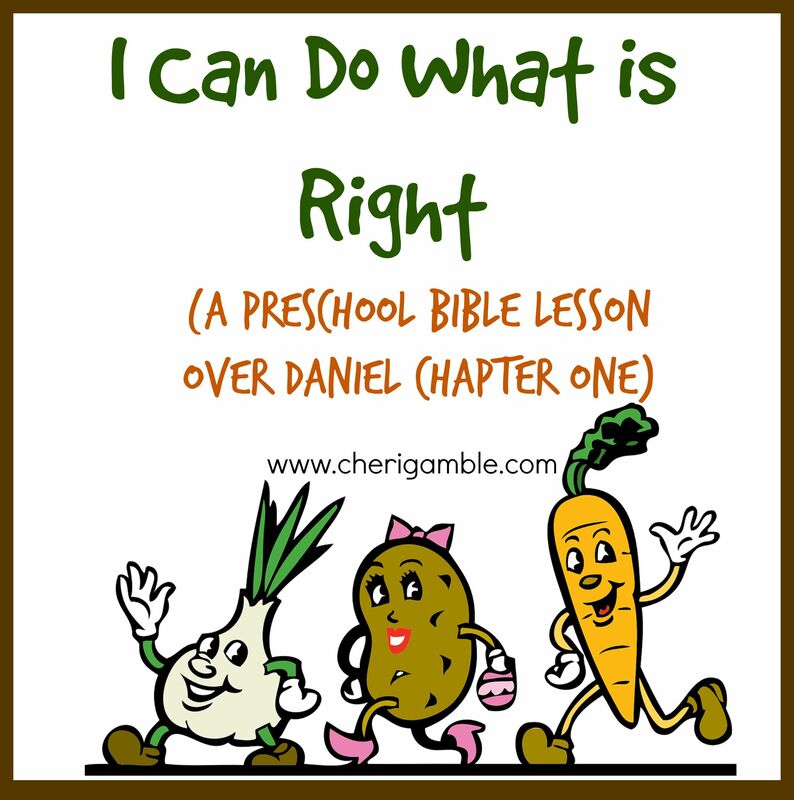 And so, here is a lesson on Daniel 1 for preschoolers — “I Can Do What is Right”. 1. Give kids several old magazines or newspapers (or even ads). Have 2 paper plates on the table, and have kids go through the ads to cut out food to go on the paper plates. One of the paper plates should be for healthy food and one should be for unhealthy. As kids cut out the food, help them place the food on the correct plate. Give them a few minutes to do this and then discuss the food they have chosen. Ask: Which plate would you want to eat from the most? Which plate would be best for you? Discuss. Then Say: Today we are going to talk about some people who chose to eat only the food that was good for them. They did the right thing, even when it was really hard! Variation: Have the foods already cut out ahead of time. Mix them up in a pile on one side of the room and have the kids run, one at a time, to the pile, choose a food, and then race to the plates and put the food they have on the correct plate. Continue until all the foods have been put on a plate. Discuss where the kids placed the food and introduce the lesson as above. 2. Bring in several healthy foods and let the kids sample them before the lesson time. You might choose to have apple slices, banana slices, grapes, carrots, broccoli, peppers, etc. Let the kids sample the food and discuss how each one tastes and which ones they like/don’t like, etc. Then say: How would you feel if this was the only food you ever ate? Would you want to eat only vegetables and fruit, or would you want to eat cake, cookies and ice cream? Today we are going to talk about some people who chose to eat only healthy food. They did the right thing, even when it was really hard! 3. Use the food from the second activity to make a “favorite food graph” with the kids. Have each child choose his favorite food that he sampled and then use the information from that to make a graph. You can have the kids color in the squares or draw pictures of their favorite foods in the appropriate squares. Say: Some of the foods you liked, and some you did not. Today we are going to find out what happened when some young men were faced with having to eat food that they knew they were not supposed to eat. Would they do the right thing, or would they eat the food? Let’s find out! Teach the story of Daniel and his friends from Daniel Chapter 1. When Daniel and his friends got to Babylon, they were put through special training to become good servants. They were going to be trained for three years before they could work in the palace! Every day they were given certain food to eat, but there was a problem. The food they were given to eat was food that God had told them not to eat! What were they to do? They loved God and wanted to serve God, so Daniel asked if they could be given only healthy vegetables and grain and water to eat! The person in charged of them did not want to do this – he was afraid that Daniel and his friends would become weak! But Daniel talked him into letting them eat only vegetables and grain and water for 10 days to see how they did. What do you think happened? How do you think Daniel and his friends looked at the end of ten days? Guess what? At the end of 10 days, Daniel and his friends looked better than anyone else! They had done the right thing by doing what God wanted, and God had taken care of them. For the rest of their training, they ate only the food that God wanted them to eat, and at the end of the training, they were the strongest, wisest men of all! Daniel and his friends did what was right, and YOU can do what is right, too! Beforehand, draw a large plate on a piece of butcher paper or posterboard. Also, draw several outlines of healthy food on pieces of construction paper or white paper. Say: Sometimes it can be hard to do what is right, but if we love God and want to serve Him, we need to always do what is right! Give each child one of the outlines of healthy food you have prepared ahead of time. Help him draw a picture in the outline of one way he can do what is right, even when it is hard. You might need to give ideas to get the kids started. (Examples of ideas the kids might have include being nice to someone when everyone else is mean, obeying parents even when you don’t want to, sharing toys, taking turns, etc.) Let the kids draw their pictures and then have them glue their pictures on the plate to make their own tasty, healthy meal. Say a prayer asking God to help all of you do what is right, even when it is hard. 1. Let the kids have fun painting with healthy foods. Provide a few different foods that can easily be used to paint with and let the kids make their own pictures. Examples of foods that would work well include cut-up apples, potatoes, or peppers, broccoli stalks or celery stalks. As the kids make their creations, talk with them about the importance of doing what is right, even when it is difficult. 2. Play a review game similar to hot potato. Pass around a vegetable while playing music and whoever is holding the vegetable when the music stops has to answer the review question. For added fun, every once in awhile shout out “I can do what is right” and all the kids have to jump up and trade places in the circle. Then ask them one way they can do what is right before starting the game again. What was the king’s name? What did he do to Jerusalem? Who did he take prisoner? Why did Daniel and his friends not want to eat the food that was set before them? What kind of food did Daniel ask for? What happened after Daniel and his friends ate healthy food for 10 days? How did Daniel and his friends do what was right? 3. Make a vegetable craft. You might choose to make a “V” is for vegetable craft using carrots and connect it to this lesson by writing “Daniel did what was right” or something similar on the top of the page, or make a carrot craft using the child’s footprint to make the carrot. If you don’t want to paint the child’s foot, you can simply trace his foot on white paper and let him turn the footprint into a carrot or other vegetable of his choosing. 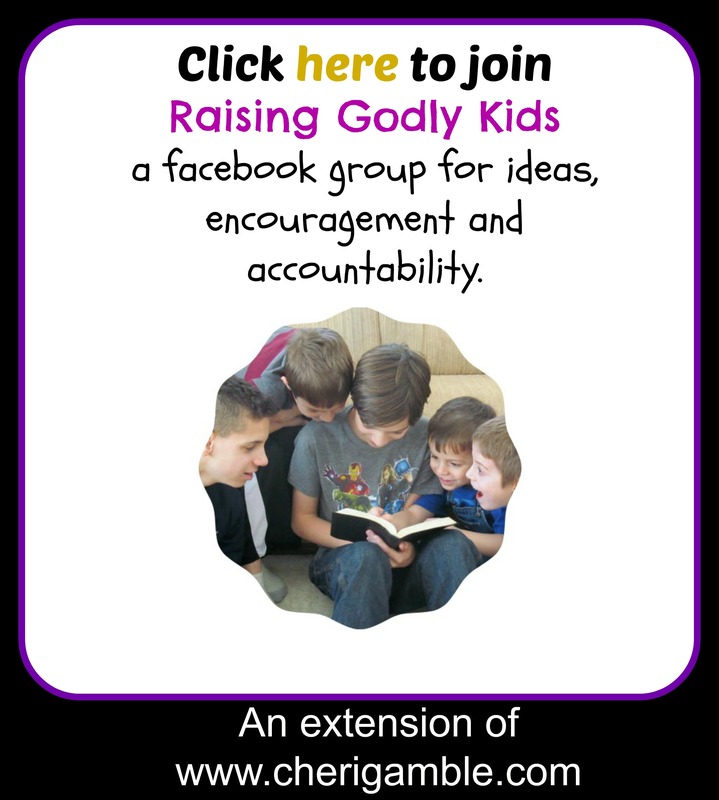 I hope you are able to use this lesson with the kids in your ministry! And I also hope you will take the time to share this lesson with others who might be able to use it, too! PS. If you like my Bible lessons, you might be interested in my curriculum for churches and families. I have a 10 week curriculum, The Call, as well as a special Easter curriculum, The Feast as well as a 35 week study over the book of James. Pingback: “A Sincere Faith” Sunday School Lesson Summary and Activities, Daniel 1:8-21 | Word For Life Says . . .